When we broke news last week with word that Verizon was going to start disconnecting a small group of “extraordinary” data users who were out of contract and still hanging on to unlimited data, we were also telling you that your unlimited data plan is no longer truly “unlimited.” In case you hadn’t figured it out yet, Verizon is now paying close attention to how much data you are using if you are out of contract, so that they can take it all away from you with notice. As noted in our story that Verizon later confirmed, Verizon has pinpointed a “small group” of unlimited data plan subscribers who are out of contract and using an “extraordinary” amount of data per month. Those users are being notified that they can no longer keep their unlimited plan and will see their service disconnected unless they switch over to The Verizon Plan. The notices started going out as early as July 21 and have informed customers that they have until August 31 to make the move without interruption. At least one of our readers has already received a letter, which you can view below. As you can see, the letters don’t actually tell the customer that they are using those “extraordinary” amounts of data and that is why they are about to lose their plan. Instead, the letter only mentions that the plan is going away for them on August 31 and they must choose something new. Since these customers are out of contract, well, that’s really all Verizon needs to do here. So what does this mean for you and the future of your unlimited plan? As I mentioned above, you should no longer consider it to be an unlimited data plan. Verizon still hasn’t said officially what “extraordinary” means, but both sources of ours and Verizon continue to push out examples of users gobbling up 100GB of data or more as a way to put “extraordinary” into perspective. I think it’s fair to say that 100GB is what Verizon is considering to be the limit. Our reader who sent in the letter above has two lines that are about to disappear because he said that he eclipsed 100GB on one of them here and there, but had another that was regularly over the 250GB mark. Again, your unlimited data plan is now a 100GB data plan that will always be hanging by a thread should you be out of contract and going month-to-month. 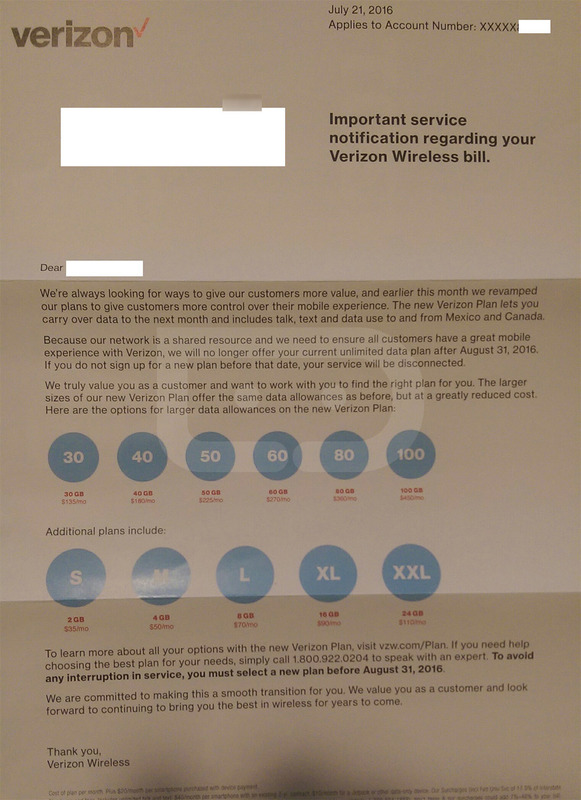 Without a contract, Verizon can simply give you notice of a change, like they are doing in the letter above, and show you the door if you don’t switch over to a plan that is suggested. At this time, Verizon hasn’t said that they have additional targets after August 31 who they will push off of unlimited data, but why wouldn’t they? In the end, they have spent the past four or so years trying to get unlimited data users off of their plans and onto their quarterly earnings-friendly tiered plans, by increasing prices, considering throttling the top 5% of users (likely the same “extraordinary” bunch here), and taking away upgrade options that allowed you to keep unlimited. I’d be shocked if another wave of users aren’t forced to choose something else after August. Going forward, especially if you are closing in on the end of a contract, you should either start monitoring closely the amount of data you are consuming each month or start looking for a new plan.